In 2012, Barrington resident Bob Lee completed Ride for 3 Reasons – a 12,000-mile solo bike trip around the borders of the United States. His ride raised funds for ALS, Cancer and Be@Ease. Through personal experience, Bob recognized the importance of documenting your wishes if you are unable to speak for yourself. This process includes designating someone to speak on your behalf if you are unable to. The unexpected can happen at any time. Be prepared and remove this unnecessary stress from your families. Once you have completed your wishes, be sure to share it with loved ones and your healthcare provider. 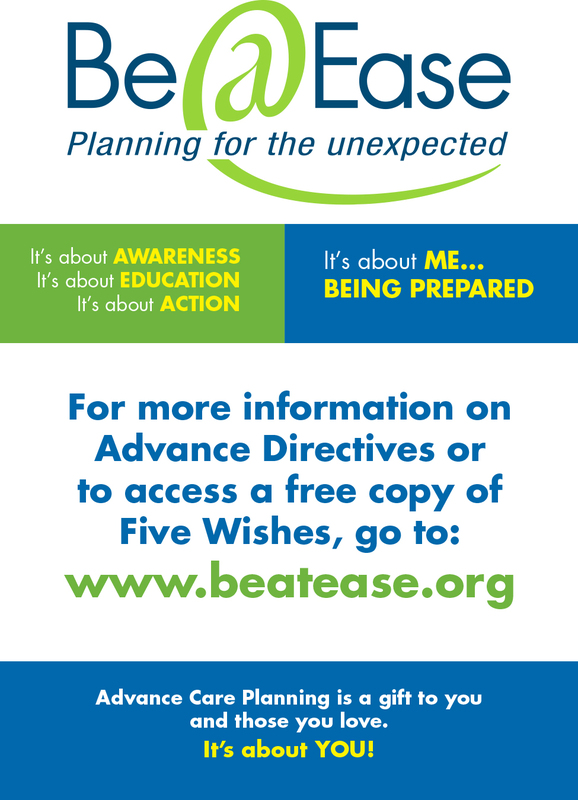 To receive free electronic copies of Five Wishes, visit: www.BeAtEase.org. If you would prefer to complete it in writing, copies are available at JourneyCare, 405 Lake Zurich Road, Barrington, IL. If you have any questions or would like additional information, please contact Rachael Telleen, rtelleen@journeycare.org, or (312) 912-2678. Each one of us has a sense for how we want the end of our life to play out. Whether or not that “end” is achieved depends largely on how well we have communicated our most basic wishes to others. In the last three years, I have experienced the deaths of two family members. Their final chapters could not have been more different. My mother-in-law died unexpectedly in 2010 at the age of 68. She had a life-long fear of doctors and hospitals. She also didn’t want to talk about death. In the end, she died in a hospital after extraordinary means were attempted to revive her. She hadn’t documented her wishes and I can’t even imagine that she wanted to die the way she did. Six months after burying her daughter (my mother-in-law), my healthy and independent grandmother-in-law, Mildred, fell and broke her hip. She was a remarkable woman and found the strength and determination to get through surgery and rehab. With the help of her grandchildren and home health care workers, she was able to return to the comfort of her home. Unlike her daughter, Mildred considered it a priority to make sure her entire family understood her wishes. As a family, we met with her and she clearly explained what she wanted at the end of her life. She didn’t want extraordinary measures to keep her alive, she wanted to stay in her home and she didn’t want to be in pain. Mildred also spoke with her physician and put her “affairs” in order. In January 2014, Mildred’s health began to decline. My sister-in-law made the call for a hospice evaluation and Mildred was admitted on a Sunday evening in early March. With hospice care, Mildred stayed at home, in comfort and without pain. She died in her home, per her wishes, just shy of her 95 birthday. I have completed my Five Wishes using Be@Ease’s 3-step planning process. It’s never too early to plan for your end. It brings a certain peace and clarity to the now.